Hi Kieran! I bet those cakes taste wonderful! Are they quite tricky to put together? Yes, they are wonderful, and they aren’t too hard except the decoration, which is a pain! can you put the directions of how to make it? It’s actually very easy – we crumble oreos for the base, then pour two layers of ice cream before it’s fully frozen, then decorate the top! These cakes look fab yum. My brother is turning 18 in March and he would love an ice cream cake for his Party. Only problem is we live in Cork and I cant find anyone here that makes these cakes, any ideas?? Hi Kieran, I’m throwing a going away party for my friend in Dublin. She’s allergic to wheat so we thought an ice cream cake would be perfect. I saw above that you were thinking of wholesaling your cakes, anywhere in Dublin they can be bought? LOOKING FOR ICRCREM CAKR FOR DAUGHTERS COMMUNION.LIVING IN CORK.DOES ANY SHOP SUPPLY THEM? Do you sell them in Dublin anywhere? Hi Kieran, I’m looking for an ice-cream cake for my Grannies 80th birthday up in Donegal. Any chance you can supply up there? Or do you think I could keep one frozen if I picked it up in Wicklow St? Thanks for thinking of us, and we’d love to help you. However, we don’t have any delivery to Donegal, and there’s no way a cake would make it there from Dublin without a freezer box, and even then would be a bit worrying. Do you have one? I just did a quick search for icrecream cake Cork and you showed up – are you still operating in Kerry and would you be able to have one of your lovely looking cakes for next week – have a friend in Killarney next thurs and they could bring it up Friday..
We do still have a shop in Killarney, but the cake would most likely melt before it got to Cork! Kieran, It is my daughter’s birthday this Thursday. 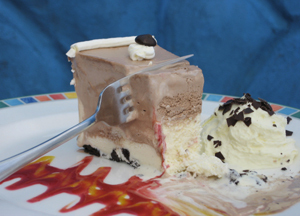 Would you be able to complete and deliver an ice-cream birhday cake in time. How about delivery? Sorry, Delivery to Donnycarney, North Side Dublin! 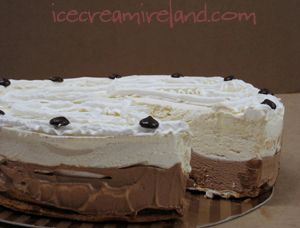 We do have ice cream cakes in our Dublin shop on Wicklow Street. If, by any chance you had a freezer bag, I’d say you’d get it home all right! Would that work? Thanks so much for your interest. Hi I’m looking for an ice-cream cake for my sons birthday ? Hi,I live about 20minutes from killarney,My friends turning 18 and we were going to have a suprise birthday for her in two weeks time and i think she would love an ice-cream cake,i was wondering how much they cost and if ye do photos on the cake or know of anywhere in killarney that does. Thanks. My daughter is allergic to egg. Do you make an egg free ice cream birthday cake? I’m afraid not. So sorry! Please can you let me know if your Wicklow street shop still makes icecream cakes and if so do you deliver to Dublin?